If you are interested in exploring your vocation to the priesthood, single, religious life or married, Fr. 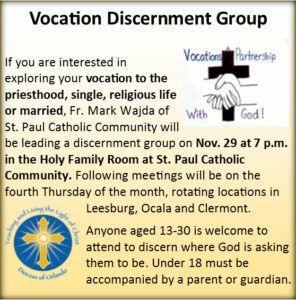 Mark Wajda of St. Paul Catholic Community will be leading a discernment group on Nov. 29 at 7 p.m. in the Holy Family Room at St. Paul Catholic Community in Leesburg. 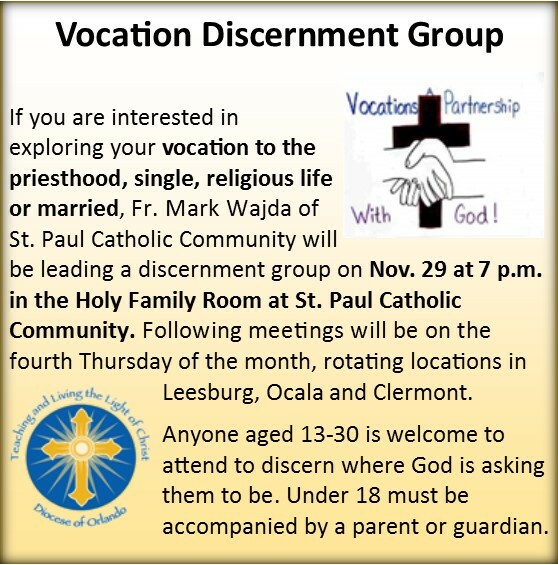 Following meetings will be on the fourth Thursday of the month, rotating locations in Leesburg, Ocala and Clermont. Anyone aged 13-30 is welcome to attend to discern where God is asking them to be. Under 18 must be accompanied by a parent or guardian.